Livingston, Illinois by Kathy Weiser-Alexander. Just four miles beyond Staunton, Route 66 travelers will arrive at the small village of Livingston, Illinois. This old coal mining community got its start in 1905, but this small town is supported today by the numerous farms in the area. This region was mostly farmland when the village of Livingston got its start in 1904. After the Staunton Coal Company was established that year, several people settled near the railroad tracks that ran parallel to the mine site. The mine attracted workers from all over the country and immigrants from around the world. The new settlement was named Livingston after a farming family upon which large veins of coal had been found. The village was laid out by the Livingston family and the first post office was operated from the Livingston Lumber Company office beginning in December 1904. David G. Livingston became the first postmaster and would hold various other positions throughout the years including a deputy sheriff, deputy coroner, and school treasurer. The village was incorporated in November 1905 and the following year, the town gained telephone service. 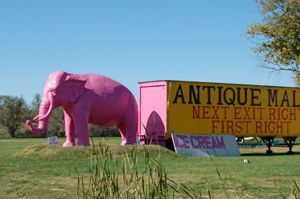 Pink Elephant Antique Mall, Livingston, Illinois by Kathy Weiser-Alexander. In 1907, a village hall and jail were constructed and a frame schoolhouse was built. In 1911 the first bank and the first church were established. In 1912, a fire broke out a large store and burned both it and the village hall and jail. The next year a new village hall was built in a two-story brick building, which also contained a jail, firehouse, and a meeting hall. In 1917 a new creamery was built as well as the town’s first high school. Over the years, more businesses and churches were built, but, in 1930 the New Staunton Coal Company was closed, signaling the first decline in the industry. Businesses and people came and went throughout the years as more mining operations closed. The last class graduated from the Livingston Community Consolidated High School in 2004 and the Livingston School District consolidated with the neighboring Staunton School District. Today, Livingston is called home to just about 850 people. Entrance sign to Hamel, Illinois on Route 66. The village of Hamel, Illinois is just another eight miles down the road. However, before reaching Hamel, you will pass the St. Paul Lutheran Church and its large blue neon cross. Placed there by the Brunnworth family who lost their son during World War II, the large cross seemingly sends a message of safe travels along your journey. Just across I-55 from the large blue cross is the restored Hamel Barn. One of the few remaining Meramec Caverns advertisements, the barn has now been restored by the Route 66 Illinois Preservation Committee. 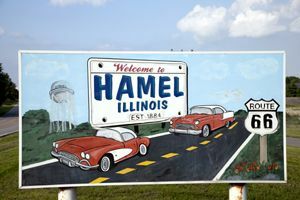 As you roll into Hamel, you will quickly see that this is a town that proudly proclaims its Route 66 heritage with banners and Burma-Shave signs. Established in 1818, this small town of less than 600 souls wasn’t even incorporated as a village until 1955. While in Hamel, be sure to check out Weezy’s Route 66 Bar and Grill located at the junction of old Route 66 and Route 140. 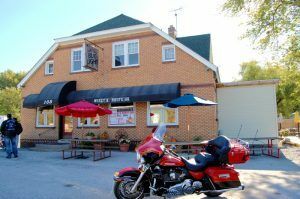 Built in the 1930s, as Ernie’s Roadhouse, this old tavern continues to serve up a cold brew to the many travelers of the Mother Road. Edwardsville, Illinois by Kathy Weiser-Alexander. 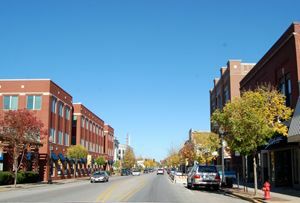 Just a short eight miles on down the road you will come to the third oldest city in the State of Illinois – Edwardsville. The first building, in what would become Edwardsville, was a log cabin built in 1805 by Thomas Kirkpatrick. Other settlers soon followed and one of the earliest cabins constructed during this time still stands at 1712 N. Main Street. In 1812 Ninian Edwards, the first Illinois territorial governor created Madison County and designated Kirkpatrick’s farm as the county seat. Three years later, Kirkpatrick surveyed the tiny settlement and named it Edwardsville in honor of the governor. More pioneers continued to arrive and by 1816, the village had two stores. One of these was owned by a man named Abraham Prickett, who had arrived in the area from Kentucky in 1808. He would become the town’s first postmaster and his son, George, was the first white child born in the settlement. The other store was owned by a man named Benjamin Stephenson who came from Virginia. Stephenson would later build a home that continues to stand in Edwardsville today. 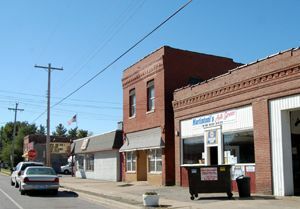 The 1820 building, designed in the federal style architecture and the first brick building in Edwardsville is now on the National Register of Historic Places. Today, the building houses a museum that features numerous hands-on period activities. The settlement was incorporated in 1819. John T. Lusk, who built the first log cabin in what many years later was to become the luxurious residential area of St Louis Street, was the proprietor of the first hotel in the city at Main and Union Streets. In its early years, Edwardsville continued to grow and Governor Edwards eventually made his home there, building a large house at the corner of Buchanan and Vandailia Streets. Unfortunately, this house has not survived. By 1834, much of the town’s trade was being absorbed by nearby St. Louis and Alton and Edwardsville’s population began to decline. At the time, the city had about 350 residents, four stores, two saloons, a castor oil factory, and a female academy. By the mid 19th century; however, Edwardsville began to grow again and after the Civil War, the town supported some 2,000 residents. Thriving along the tracks of the railroad line, more businesses began to be established along with several factories. In 1890, N. O. Nelson relocated his plumbing and fixture factory on the outskirts of Edwardsville. Surrounding the factory, he also constructed his own model company town, based on the principles of the cooperative movement and profit sharing between owners and laborers. Workers chose the name for of Leclaire, after Edmund Leclaire of France, one of the pioneers of profit sharing. The town ultimately occupied 150 acres and included an abundance of educational and recreational activities. 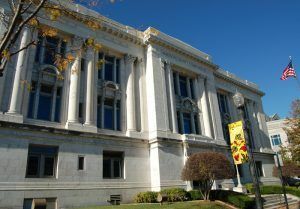 Today, Edwardsville is home to over 21,500 residents and provides numerous peeks of history and architecture. The Edwardsville Historic Preservation Commission has designated 40 local landmarks, which include a number of historic homes. There are two districts on the National Register of Historic Places including the Leclaire district that encompasses N. O. Nelson’s company town, and the St. Louis district, a tree-lined residential area exhibiting a variety of architectural styles. 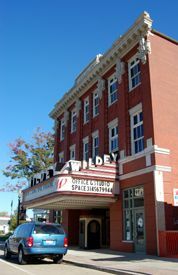 The downtown area of Edwardsville has many commercial buildings built in the late 1800s which are well worth a look. Madison County Courthouse in Edwardsville, Illinois by Kathy Weiser-Alexander. As you leave Edwardsville, watch for the old Town and County Motel sign on the right side of the road, just before crossing over the I-255 overpass. Continue your journey along Route 66 to the city of Mitchell, the Chain of Rocks Bridge, Collinsville, and the Show Me State of Missouri. The restaurant in Hamel, Illinois, is Weezy’s Route 66 Bar and Grill. It has been since July of 2009.